Experience Sedona’s rich art culture with a tour of the various and diverse art galleries of Sedona. Enjoy the talented creations of local artists through various mediums, and on occasion encounter the artists at work in their studios. The Sedona Arts scene has become “A new west enclave of galleries.” – New York Times. The Sedona Chamber of Commerce and Steve Segner of El Portal Sedona Hotel have developed a tour or walk of Sedona’s galleries, so tourists and locals alike can see and appreciate why Sedona is a world-class art destination. In addition to the Sedona Gallery Art Walk, Sedona art galleries, through the Sedona Gallery Association, offer a distinctive showcase once a month highlighting artists, special exhibits, art events and receptions throughout Sedona’s galleries. This unique experience is called First Friday and takes place on the first Friday of each month, from 5:00pm-8: 00 pm. This is a wonderful time to explore Sedona’s art scene, enjoy refreshments and even discover a “find” to take home. 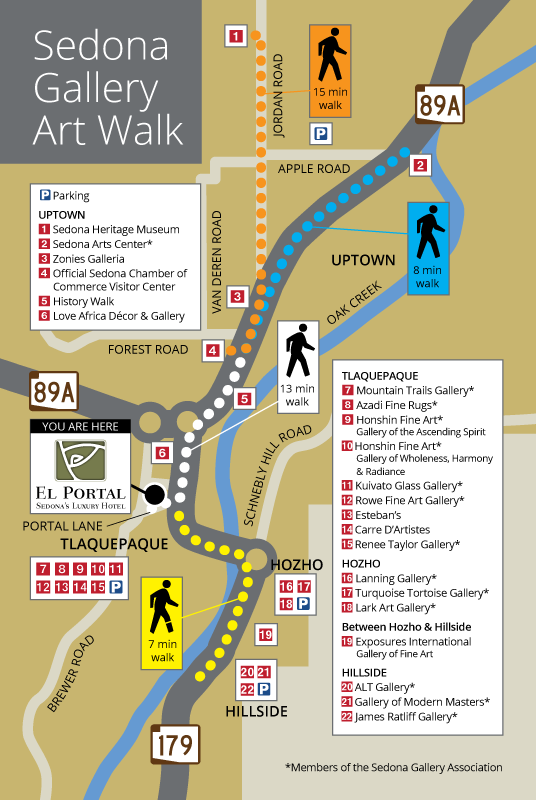 The Sedona Trolley provides free transportation to wander from gallery to gallery.